Bethany Bongiorno, a former software engineering director at Apple, shared a bunch of interesting stories about the creation of the original iPad on the 8th anniversary of the tablet’s launch, in a series of Tweets on Sunday. 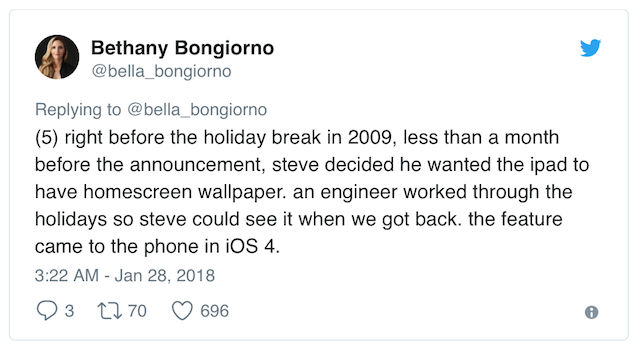 Bongiorno recalls how the iPad came to have the signature linen background when scrolling, as well as how Steve Jobs chose the right stage chairs for the keynote. 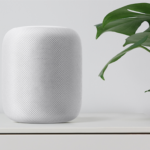 She also told the story of how Apple tricked some third-party developers before the launch of the iPad, who were expecting to visit Cupertino for a single day, but were instead told to stay for weeks on end. (1) steve carefully chose the le corbusier chair that was used for the event. there was a sea of LC2 armchairs and each was carried out so he could inspect it in the stage lighting. did it have the right coloring? was there wear in the right places? did it have the right sit? (2) when the third party developers were brought in a few weeks before the event, they were told they were only flying in for the day for a meeting. when they found out they would be stuck there for weeks, we had to take them to target to get more clothes and other necessities. (3) the third party devs were escorted and monitored at all times. we all signed up for shifts, even on the weekends. they weren’t able to bring their phones into their workroom, or use wifi, and the ipads were hidden in stealth cases so they couldn’t see the ID before the event. You can read them all on Twitter at this link.